The Kipahulu 'Ohana invites you to view panoramic scenes of Kapahu Living Farm, its taro patches and surrounding areas in the Kipahulu District of Haleakala National Park. The taro plant, used to make poi, is a sacred ancestor of the Hawaiian people that can't be owned, protesters said yesterday. Taro, the Hawaiian soul food, is grown throughout Hawai`i in two ways--on dry land or in shallow, watery terraces and patches called lo`i that Stilts and other native Hawaiian birds frequent. Taro begins life as a corm, or underground stem. The parent corm produces glossy green heart-shaped leaves and anywhere from two to 15 suckers, or shoots called oha. The oha is one method by which taro propagates or reproduces. The Hawaiian word for family isohana, which means many shoots. Taro is deeply entwined with family and just as intimately linked with Hawaiian language, mythology, land, society and even table manners. Hawaiians call it kalo is the number one staple of the Hawaiian diet and loaded with nutrients. Don't miss out on a buying a bag of crunchy deep fried taro chips at the local market. Try it in biscuits, bread, muffins or pancakes. Cook the leaves and eat them like spinach. Get taro baked, boiled, steamed or mashed into paste-like poi;but you might have to wait in line for the latter, because local people know when bags of fresh purple poi arrive in the store and everyone has a favorite brand. For some, poi is an acquired taste; for others, i's a way of life, with many known and proven health benefits. Taro lovers harvest and peel the corms the underground tuber ;then cook them and eat them like potatoes. They mash the well cooked corm with water to make poi. Taro is an excellent source of carbohydrates, and because it is an alkali-producing food, it helps to balance the pH factor in the body. Taro leaves, called lu`authey give the Hawaiian feast its name--taste similar to spinach and are rich in calcium, iron, phosphorus, thiamine, riboflavin and vitamins A, B and C.
In the last decade, a study engaging native Hawaiians on a heritage diet featured taro as a key menu item. Participants experienced significant weight loss and improved health, with much of the credit for the results going to taro. Easily digestible, taro is the perfect food for babies and the elderly. A manufacturer of powdered taro ships it internationally to hospitals seeking supplements for babies with food allergies. One of about 30 or so species of plants that ancient Polynesians brought with them to these islands in their voyaging canoes, the precious taro is deeply entwined in the culture. An ancient Hawaiian chant, the Kumulipo, details the creation of the universe. It tells of Wakea, the sky god, forming a union with his daughter. Together, they had two sons. The first son, Haloa-naka it means long, trembling stem--was born malformed, apparently lifeless. Buried outside the home, Haloa-naka grew to become the taro plant. The second born son was perfectly formed. Wakea named him Haloa, which means long stem. Haloa became the first man and the ancestor of all Hawaiian people. 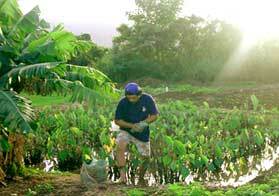 To this day, Hawaiians love, respect and malama, or care for, the taro plant, revering it as an elder brother. Hawaiian people malama the taro plant, and in return, the taro will malama us back by providing food. Protocol is extremely important in Hawaiian society. In ancient times--and in some families today--when dining together around a poi bowl, family members take turns dipping one or two fingers into the poi bowl to scoop up poi, sustaining themselves through their older brother. Hawaiian culture teaches respect for the kupuna, or family elders, and because Haloa-naka is present in the open poi bowl, traditionally there is no displaying of anger or quarreling during mealtime. A cover for the poi bowl stands nearby in the event there might be an unintentional breach of protocol. To experience and appreciate taro in its many forms, and honor the `ohana of taro farmers and other people who malama `aina, or take care of the land, check out taro festivals held at various times throughout the islands. Just remember, no fighting over the open poi bowl! !